Web 2.0 tools can be fun, effective and a waste of time. Basically, as with any other product, there can be a wide range of effectiveness with each tool. Upon starting this investigation of different web 2.0 tools, I can remember getting excited about the possibilities of each tool and with some of them; the results were disappointing and a waste of time. Also consistent with other products the positive results often outweigh the negative. I found it critical to remain focused on several aspects of the inquiry in order to effectively evaluate each tool. 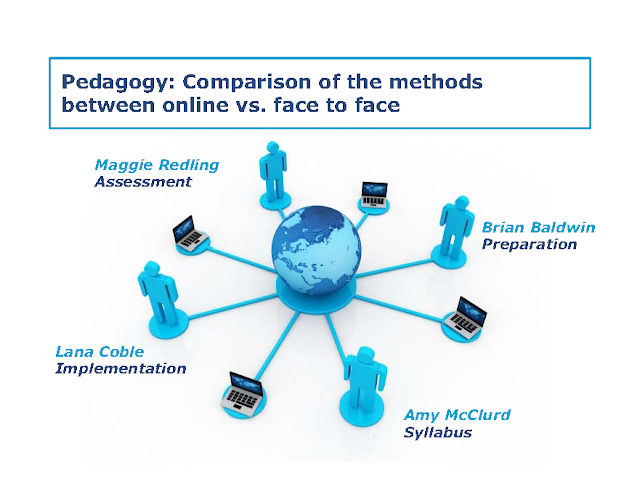 The sub paragraphs below describe what I believe to be essential elements in evaluating the ability of each Web 2.0 tool to meet your particular needs. Bells and whistles, a.k.a. special effects, are generally common with Web 2.0 tools. They capture the imagination and create interest from the users. In order to be objective and effective in your evaluation, it is critical to stay focused on what you want the software to perform and not be distracted by the special effects. The first example that comes to mind is ResearchGate. This program has a special effects feature where it will create an index rating of each person using the program. This rating index is based upon articles written, reviewed and a few other factors however what they don’t state is the sources are all contained within the software. The number of research articles within the program is minimal; hence the special effect has less effect if you know the basis for the calculation. Another research program utilizes other known databases so the effectiveness of the program to enable efficient research is far greater, yet there is no special effect. The lesson? You guessed it, stay focused on what you want to get from using the tool and minimize approval based upon the WOW factor of the special effects. WILL THIS TOOL CREATE EFFICIENCY FOR ALL INVOLVED? The means of processing information within a program is critical to creating efficiency. If a process takes several clicks to create information in lieu of just one click then the program will not have a long shelf life. In this modern era, where convenience and instant access are the norm, it is essential to simplify these functions. The example which comes to mind is the program bit.ly. While this program will shorten a url, it takes 3 clicks to perform the function. Where by simply cutting and pasting a long url address, it only takes a single click to go to the site. People today are easily distracted and overloaded with their schedules so taking these additional steps doesn’t make much sense, efficiency matters! The key for repeated use is to find a program that will do more of what you need so that you don’t have to go from tool to tool. This may be a high expectation but ease of use is increased when we can find one tool that serves multiple functions. Wiggio is the one tool that comes closes to fulfilling this mantra. For example, this collaboration tool includes conference calling, virtual meetings, voice notes, video notes, discussion board, document management, emails and text messages. It also has mobile platforms on iPhone and iPad. Now that is functionality in one tool! One of the repetitive elements from every Web 2.0 tool is communication; therefore it is critical to evaluate its effectiveness. Evaluation points include mobility platforms and the modes of communication; i.e. email text messaging, video, etc. With the popularity of smartphones mobility is very important in reaching the greatest number of users. Quizlet is a program that has tremendous potential as a learning aid. Its functionality is enhanced in that it draws upon a pre-existing database and allows individual knowledge to be added to the system. Upon my initial review of the program, there didn’t appear to be a mobile application which lessened the prospect that it would be utilized by my students. Closer review indicated that there were several third party programs which enabled smartphone access in both apple and android platforms. This element made this program viable for use by the greatest number of users. DOES THE TOOL SPARK OR INHIBIT CREATIVITY? Fun and creativity are essential in keeping the users attention while utilizing the tool. And if you don’t believe this concept then ask yourself, “Why are video games so popular in the learning environment?” One particular tool that is intuitive and fun to use is Mindmeister. The ease of use and the fun of linking ideas together in a mind map keep the user engaged while creating a useful product for conceptual planning. Based upon my review of Web 2.0 tools, I found the platforms below to be less than expected. The basis for my evaluation of each tool ranges from complexity, lack of depth or poor final product. The tools below are either robust in their capabilities, highly intuitive or perform their singular functionality extremely well. I invite you to check them out for your own use. Finally, my last recommendation is made specifically for the Construction Management Program at the University of Houston. The selection of the programs was based upon their ability to assist with group collaboration as this is a focal point in our program. All three recommended programs are very capable of group collaboration and each deal with specific phases in the preparation of group projects; brainstorming, project development and final presentation. If you are interested in viewing this recommendation, please click on the link below. My pursuit of knowledge would not have been as comprehensive without the sharing by my fellow student’s on Web 2.0 tools and the guidance provided by Dr. Sara McNeil and Dr. Bernard Robin at the University of Houston. Thanks to all for their efforts and belief in collaborative learning. Mendeley is a web 2.0 tool for researching topics on the internet and then subsequently annotating the collections for the pertinent data needed for a report. The program interfaces with a multitude of internet scholarly databases for easy access on a wide array of studies. This interface includes a plug in where the documents found within these databases can be loaded into the user’s personal library with the click of one button. This streamlined technology plus the ability to create user specific folders for archiving documents creates a very efficient means of handling research information. In addition, the program enables efficient cut and paste creation of notes for a highly productive process in mining the information that you need for your specific research project. Lastly, citations in all of the major formats are quickly created in Microsoft Word through a one click menu button so the user doesn’t need to know the specifics of each citation format. 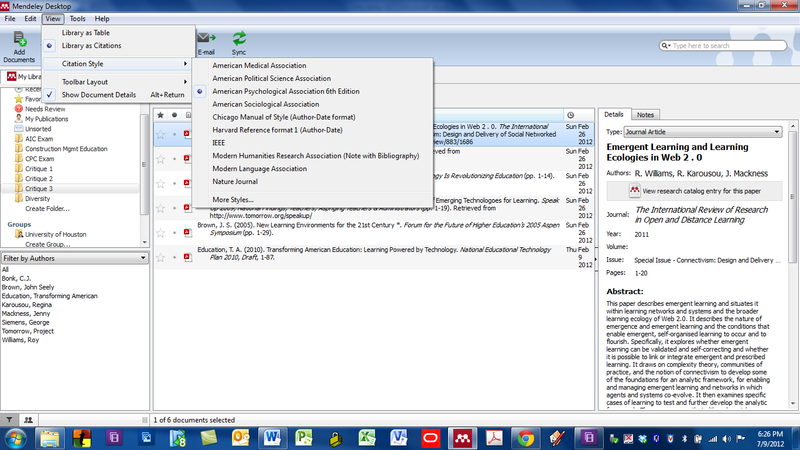 With Mendeley, productivity is obtained without a premium as all these features are available in the free version. Research is made easy for the layman or the experienced professional. 2. You will need to set up a profile but it doesn’t have to be completed in order to start using the program. The benefits of the profile are simply so Mendeley can recommend papers and people associated with your interests. 3. For mobile applications simply go to the app store and download the application onto your iPhone or iPad. Data that you want to import into the software or ability to search databases for research publications (note this is optional as you can search the web from your library within Mendeley to retrieve articles on the web). 1. Upon entering the program you will be directed to My Library where your personal research folders are located. 2. You may now start your search by placing your topic of interest in the search box located in the upper right hand corner of the screen. 2. For an introduction to this program go to this video link (created with PowerPoint and Adobe Premiere Elements 10). Since the example I have is my personal research website, I have prepared a highlight video, (created with Adobe Captivate) so that you can see the unique productivity of the program. This will also demonstrate how I am using the program. This tool can aid with instruction on how to research a topic and streamline thoughts in order to write a report. Since most undergraduate coursework requires writing either a literature review or technical paper, this application would be ideal for either. Mendeley would assist in organizing the information and reinforce the concept of initially acquiring research followed by analyzing the article to create annotations of the relevant information for a specific research assignment. Since Mendeley has an extensive database and utilizes a plethora of outside search engines, it would be ideal for a variety of fields of study. With the high usage of computer technology in K-12 education, I can envision the use of this tool in grades 7-12. The research may not be as extensive as in higher education, but writing papers are analytical thinking in research are still important skillsets to acquire. When learning how to create literature reviews or technical reports one of the hardest elements to master is the formatting of the document. Each research type has distinctively different ways of presenting the same information. While this program doesn’t provide the overall template for the final products formatting, it does create the citations with the touch of a button. This is especially helpful if you are creating papers for an English class and an engineering class where the citations are APA and IEEE, respectively. This is the most productive element of this program. In case you missed it earlier, the highlight video, (created with Adobe Captivate), demonstrates how this works. Basically, you can annotate notes from each of your documents in your library. This annotation process is simple and allows the researcher to focus on the elements of the document that relate specifically to their research topic. This enables the analytical thinking process and facilitates an easier way to organize your thoughts when it’s time to write your paper. This is the jewel of the program! 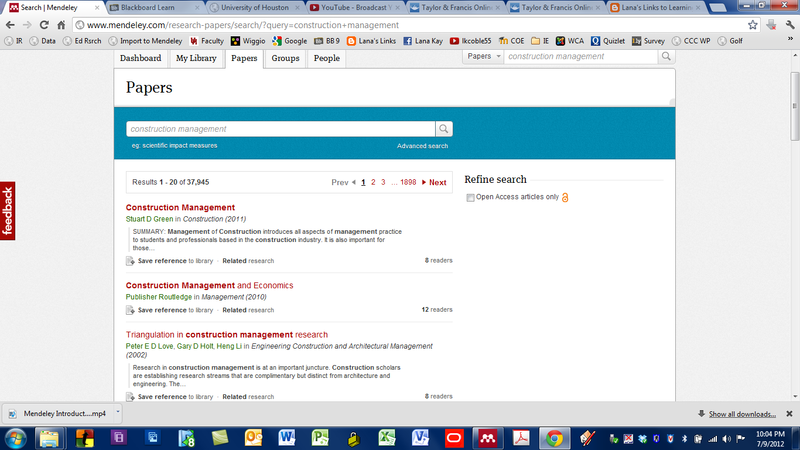 For those users who are unfamiliar with the wide range of scholarly databases, Mendeley enables quick and easy searches on topics from the My Library view of the online program. When starting the research process, the biggest step is getting started. Once other sources are identified then it gets easier to follow the path to more detailed information regarding the user’s research topic. This program facilitates this experience and simultaneously exposes the user to the research process. While Mendeley is available on iPad and iPhone, the annotation capability is not enabled in these devices. The program could be made more robust with this functionality with the increased uses of these devices by students. So far, this product exceeds my expectations and performs better than the more popular programs such as ResearchGate, Refworks and Endnote. I would recommend this to any student or faculty member who needs to perform research on a single or multiple projects. The benefit is in the ability to organize and annotate notes for easy reference from articles you have researched. This functionality enables quick access to the information you need as well as streamlines the process of organizing your thoughts. This program is the BEST OF CLASS! This program was designed by researchers, for researchers. This program is a social networking tool for faculty performing research. One of the goals by the Ijad Madisch, the scientist who created this online forum, is to allow fellow scientists to collaborate on research projects by asking questions online which allows other researchers to participate in the overall project. For more information about the program, watch and listen to the slide show @ SlideRocket. To see my profile, please login to the program and search my name (Lana Coble). This product could be utilized by students who are working on longer term research projects to gain insight into other more established researchers and their approach to similar topics. Shorter term research papers probably wouldn’t provide a wealth of resources as this database is not as populated with actual research findings. The more conventional and beneficial application would be for faculty members who want to connect with fellow researchers on long term research projects. It’s FREE! The developer is committed to the idea of collaboration. This program is specifically designed for the purpose of connecting researchers. The original sector was aimed at medical research, but as the word spreads more disciplines are joining. One of the more interesting features of the program is a ranking index of each participants activity based upon the number of questions they pose to fellow researchers, the number of publications, the number of answers provided to fellow researchers questions and the number of followers within ResearchGate. This is an interesting concept and promotes activity and allows beginners to identify who to follow within the program. This aspect of the program follows the same model for both linkedin and facebook with the obvious exception being the content. This program seems to be more heavily used by European and Middle Eastern scientists. When investigating the program there were not many United States members within the program. This is a bit of a disadvantage in that some of the more significant issues to the U.S. may be overlooked within the program. This is a bit of a disappointment. I can only hypothesize that U.S. researchers are not as willing to share in their research until they have published. I did an exhaustive search within the program to find journals that are relevant to the construction management field of study and only found two journals. It appears as the more popular journals, i.e. 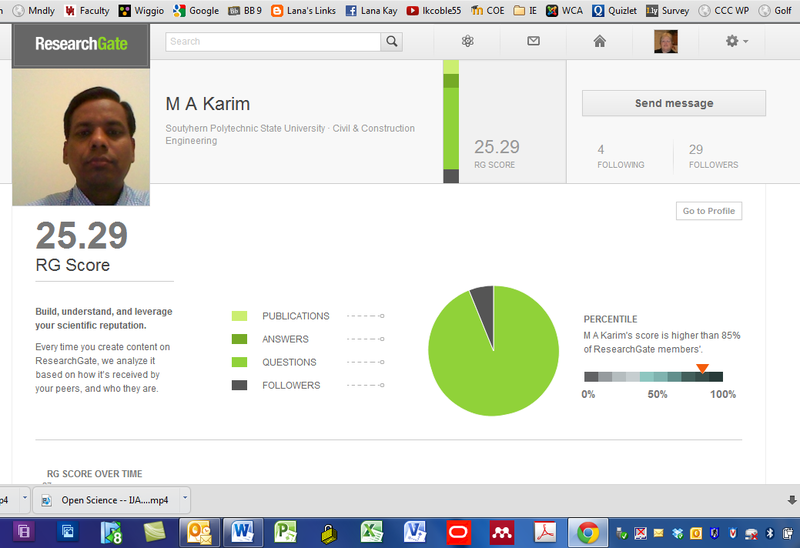 education and medicine, are more available within ResearchGate. WOW! This tool is phenomenal! It is mobile, visual, and auditory with additional benefits of telestrator technology. This product provides the missing link to conventional PowerPoint presentations. Collaboration is the core of this online platform and enables teamwork in a variety of forms. It was simple to create a group and then upload the PowerPoint slides with one click. The menu is intuitive and simple so adding video or voice notes are a breeze. The telestrator allows you to mark up the slide to provide further explanation of your point. Mobility is enhanced with both iPhone and iPad apps so you can quickly add your comments and thoughts as they come to you. The only aspect of the program which I find disappointing is the inability to import videos from YouTube into the content for collaboration. It appears that the only videos that are allowed into the program are those webcam videos the user records directly into the software. Perhaps this could be the next evolution of the software to expand content. It should be noted that if you acquire a one year $99 faculty license, you may archive the projects or you can download individual copies for $2.99 each. I have paid the $2.99 to see what the final product would look like so you can see for yourself. The quality is very good. Compared to Starbucks, it's cheaper, will last a longer and can be used as a teaching aid to students as visualization for the final project. I have included both an mp4 and mov version of the team presentation and you can see that the quality is not as good when compared to the presentation within the VoiceThread. While the export was easy to execute the quality of the final product could use some improvement. To see an example of this online tool, please click on the link below. This example was a team project created by Brian Baldwin, Lana Coble, Amy McClurd and Maggie Redling in an online graduate studies course, CUIN 7356 and 7376 at the University of Houston. Note: you will have to set up a free online account before accessing the group below. the team would have a consistent visual approach. them into VoiceThread and notified the group. and equally contributing team members. When thinking about the potential educational application of this tool, I can envision its usage with team projects, specifically the preparation of team projects. The capability of providing video notes is a good preparatory step to making an actual presentation for students. Most students haven’t made many formal presentations in their undergraduate studies so they are nervous and don’t realize how they come across. One of the items that I stress with each of them is to practice their presentation and record it on video so they can refine their typical practices that don’t present well, i.e. swaying, using the same word like “uh” numerous times, and not making eye contact. Oftentimes, students don’t have the resources to perform this exercise but with the use of VoiceThread, they could perform some level of this concept. Instructors could utilize this tool to perform both verbal and visual feedback to the students’ final presentation thereby allowing in depth commentary and a better learning experience. With the global economy consulting projects could be enhanced when team members are located around the globe. A current example which comes to mind is a consulting project for scheduling a major design effort in Doha. The time zones between Doha and Houston don’t promote conference calls but the use of VoiceThread would allow each party to contribute to the schedule at their convenience and the use of voice and video when added to the physical document would enhance understanding. Another example that I am currently utilizing is the development of a video storyboard. Since this involves brainstorming and ideas will generally evolve in a nonlinear fashion, this tool is ideal for this purpose. Of particular importance, the content of the video entails stories generated by my client so it aids in gaining familiarity with the nuances of the subject when I can hear the inflection in their description of the subject.